As if we don’t need another good reason to make sure we are including some fresh vegetables in our diets, along comes another one in the form of vitamin K.
This nifty little vitamin helps to maintain a multitude of important functions in our bodies. This is an essential vitamin when it comes to things like blood clotting and for avoiding dreaded diseases such as Alzheimer’s, heart disease and cancer. There are tens of thousands of people who depend on medication such as Coumadin or Warfarin to prevent blood clots, and unless you are one of them, there is no reason why you should not be taking plenty of vitamin K in your diet. Vitamin K foods include cooked or raw green leafy veggies like cabbage, cucumber, asparagus, broccoli, Brussel sprouts, green beans, okra, lettuce, and the like. The average daily requirement of vitamin K that we need in this form is around 120 micrograms (μg). • As mentioned above, vitamin K is vital for blood clotting, reversing the effects of blood thinner medications. Vitamin K also treats vitamin K deficiency, where the body doesn’t have enough of this vitamin. • It treats weak bones (osteoporosis). • It relieves itching that is often associated with liver diseases. • Vitamin K lowers the total cholesterol of people who are on dialysis treatment. • It is known to remove spider veins on the skin, to remove scars, stretch marks, burns, and bruises and used topically, treats rosacea, a nasty skin condition that causes pimples and redness on the face. • After undergoing surgery, vitamin K helps to speed up healing of the skin and to reduce swelling and bruising. • Breast cancer: It is suggested that taking in vitamin K2 lowers the risk of developing breast cancer. • Cystic fibrosis: People who have cystic fibrosis might have low levels of vitamin K due to their problems digesting fat. Early research suggests that taking vitamin K orally can enhance osteocalcin production – important for metabolic regulation and bone-building. • Lung cancer: Research is suggesting that taking higher intakes of vitamin K2 could be linked to reducing the risk of lung cancer. • Prostate cancer: Research suggests that higher intakes of vitamin K2, not vitamin K1, could be linked to a reduction in the risk of prostate cancer. Getting enough of this important vitamin, as you can see from the above, is integral to good health and when there is a deficiency, a long list of health problems can develop. • Vitamin K1 – consisting of leafy vegetables. • Vitamin K2 – found in fermented foods and animal products. You will find vitamin K2 also being produced by the friendly bacteria in your gut microbiome. 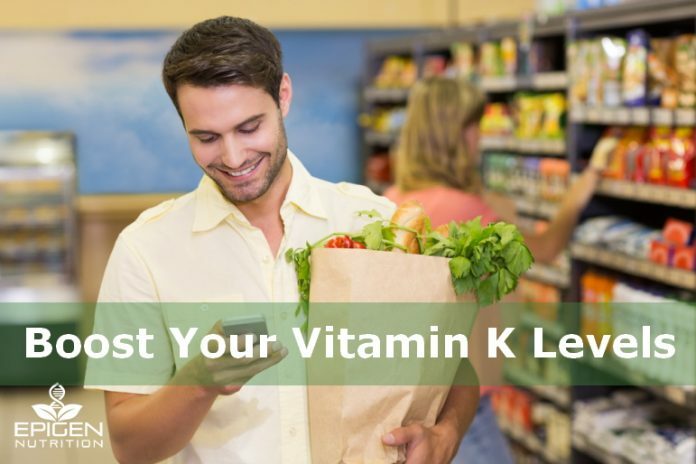 Do You Have a Vitamin K Deficiency? When a newborn is vitamin K deficient the signs and symptoms could be similar to the above, but when the case is more serious, bleeding in the skull could be involved. This valuable vitamin was discovered by a Danish scientist, Henrik Dam. From his research, he named it vitamin K, which is abbreviated from the word Koagulationsvitamin. In English, this means the “coagulation vitamin”. Another biochemist, Edward Doisy continued Dam’s work to discover more exciting roles that vitamin K plays in the body, and both these scientists received the Nobel Prize in 1943 for their amazing work. Years later, we are beginning to unearth the multiple functions this coagulation vitamin is performing in the body – truly amazing vitamin K1 and vitamin K2. Previous articleIs Your Food Causing Irritable Bowel Syndrome (IBS)?